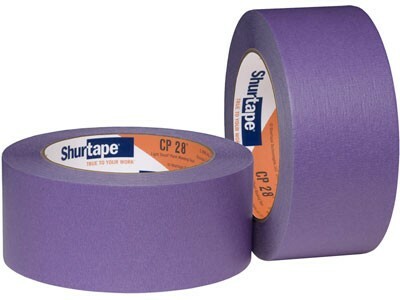 CP 28··clean removal, professional painting tape is designed for applications that require a low tack adhesive system. ·This tape can be applied to delicate surfaces for up to 30 days and then removed without causing surface damage. Specific applications include: wallpaper, freshly painted or unpainted wallboard, ceiling tiles or stripping for faux finishing. Typical Applications: Drywall. Wallpaper. Delicate indoor surfaces, including faux painted surfaces.